Although she looks like she's having tons of fun, she still has not gotten over her nervousness around water. We kept having to really encourage her to run through the fountains. Rachel's site has more photos and thanks to her for this one. Our camera is being fixed and hopefully will be home soon. Rachel arrived Friday and will stay until Oct 09. Yeah! Kyle's been away for the weekend so it was nice to have some company. He should be back any moment from his Men's Retreat on Mustang Island. Lucky him. And no, this area did not get hit by Hurricane Ike - it's farther south, closer to Corpus Cristi. I thought I would show all of you some of the wonderful projects Kyle worked on this summer. So I thought I wouldn't be as excited the second time around to see the ultrasound pics. But we got to see the 3-D version which was pretty cool. 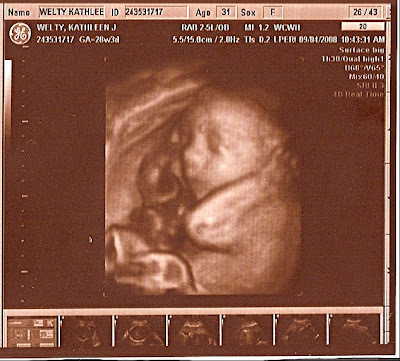 Apparently, he or she has a lot of hair already and a cute nose. But the really good news is we have a very healthy baby and even a little bit big weighing 2lbs 13oz so far (which is completely the opposite to Lillian). Exciting, exciting. The baby is still expected to arrive around November 24.